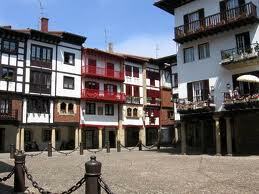 Hondarribia was founded in the 6th century, in the Basque region of northern Spain. This popular seaside town sits on the south bank of the Rio Bidosa and is only a stone’s throw away from the French border. Its well preserved old quarter was first fortified in the 7th century with solid stone walls which ultimately protected it during a bombardment of sieges during the 17th century. This amazing city is worth a visit when visiting the Basque region. At the highest end of town is the Plaza de Armas where the Castle of Emperor Carlos V stands, now the Parador de Turismo. This is also where one of Hondarribia’s most important festivals takes place in September, the traditional Alarde which first began in the 16th century in gratitude of the end of the siege imposed by the Prince of Condé. Not far from the Plaza is the Gothic style 15th century church of Santa Maria de la Asuncion. The ornate Plaza Guipuzcoa is one of the main squares surrounded with historic buildings, and passing through the Gate of Santa Maria you will reach the city’s busiest street, the Calle Mayor. Opposite the Town Hall are two of its finest palaces, the Casadevante Palace and the Zuloaga Palace with its magnificent stone staircase. Hondarribia’s main beach, the Playa de Hondarribia, stretches 800 metres and is one of its main attractions and there are plenty of water sports available such as windsurfing and jet skiing and diving. The beach actually divides the fishing port from the district of La Marina. From the port there are trips to the Higuer Lighthouse and the Castle of San Telmo where you can get lovely views of the coast. The district of La Marina lies outside the walled city near the waterfront and is quite stunning, with the old fisherman’s cottages and their colourful painted facades. The waterfront has lovely seafood restaurants, old fashioned bars and a wonderful atmosphere which is why it is always popular with the tourists. 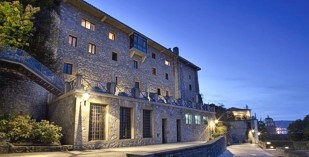 A popular four star hotel in Hondarribia is the Parador Hondarribia (Hotel El Emperador) once a fortress dating back to 980AD. 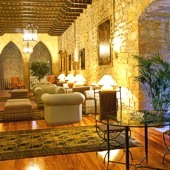 Its thick stone walls and historical decor give the guests a truly authentic experience of being back in the Middle Ages. So if you wish to experience something a bit different this would be a wonderful choice. The Basque region is well known for its cuisine and has an abundance of seafood dishes. Once a year there is a pincho competition, a famous Basque snack, and chefs from all across the region try to top each other with creative recipes. However, this region is also known for its Rose wines, Merlot, Riojas and elegant Chardonnays so absolute heaven for wine lovers. If you wish to explore beyond the city itself there is certainly plenty to see. The remains of a Roman ship can be seen at Cala Asturiaga, a cove near the new port. Not far from Hondarribia is the elegant city of San Sebastian which is a traditional summer resort and the capital of the province. Its new suburbs, La Concha beach, and cultural lifestyle make it one of the most attractive cities along the coast. There are also activities such as Jeep rides, scuba diving, sailing, surfing and canoeing nearby. The nearest airport is only 1 km away which means it would make quite an ideal destination for a weekend away. Being so close to the French border it has that wonderful mixture of Spanish and French influence making it quite special.